This narrow street in Dublin used to be known as Smoke Alley but had been called Smock Alley for a long time before the Master of the Revels, John Ogilby, decided to build a new Theatre in 1662. His previous Theatre in nearby Werburgh Street had been opened in 1637 but was closed by the Puritans in 1641. This new venture proved to be very successful and in due course the Theatre was awarded a Royal Patent and so became the first Theatre Royal in Dublin. There was a close affinity between the Smock Alley Theatre and the Theatre Royals in Drury Lane and Covent Garden in London. Many of the London artists appeared in Smock Alley and vice-versa. The Theatre may not have been very well built because on St Stephen's Day in 1671 the gallery collapsed and 3 people were killed and many others injured. On another occasion in 1701 during disturbances in the Theatre a number of people were killed. 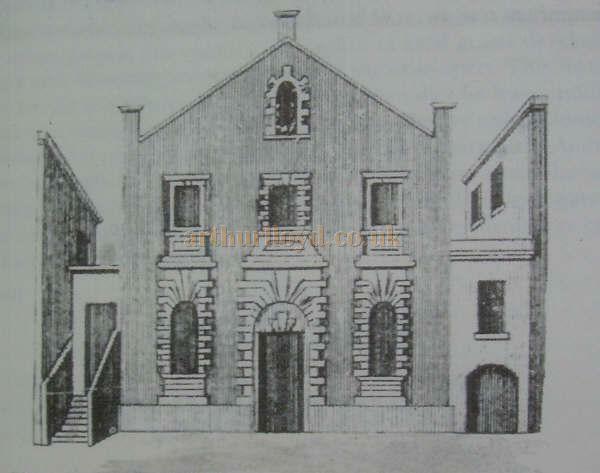 In 1735 the Theatre was extensively rebuilt and refurbished and continued in business. 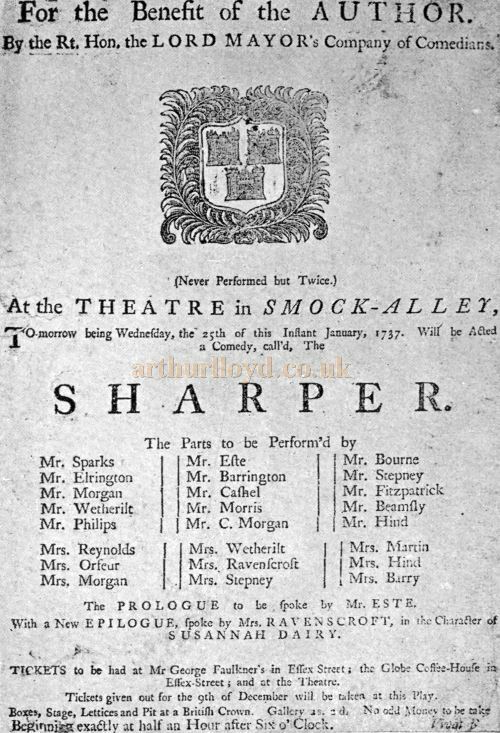 Right - A Playbill for the comedy 'The Sharper' at the Theatre in Smock Alley, Dublin on January the 25th, 1737. The production was produced for the Benefit of the play's Author, Michael Clancy - From Shakspere to Sheridan by Alwin Thaler, published in 1922. The Bill is captioned in the book as one of the oldest known Irish playbills. The General Evening Post of the 24th of May 1735 reported on the laying of the Foundation Stone for a new Theatre to be built on the site of the old in which they said: 'Yesterday was begun the building of the Theatre-Royal in Smock-Alley: The Foundation Stone being laid in presence of the Gentlemen of Distinction Several Pieces of Gold were given to the Workmen, to drink their Majesties Healths, and Success to the Undertaking. This House is erected pursuant to his Majesty's Royal Patent, and will be as complete a Theatre as any in, Europe. It is built on the Ground where the Old, Theatre Royal lately stood, which is the most convenient Situation for the Entertainment of the Town. - The General Evening Post, 24th of May 1735. Shortly afterwards there was competition from a new Theatre, opened in October 1741, built just around the corner in Fishamble Street called Mr Neal's Musick Hall. Further competition came in 1758 when another Theatre was opened not far away in Crow Street. This was owned by an actor named Spranger Barry and his partners and they succeeded in obtaining a Royal Patent that was taken away from the Smock Alley Theatre. This was a serious blow to the Smock Alley owners and eventually the Theatre closed in 1787 and was used for many years as a grain store because of its proximity to the Custom House on the banks of the River Liffey. In 1815 a decision was taken to amalgamate two Catholic parishes so a new church, to be named St Michael & John, was required. The Church authorities bought the old Theatre building and for financial reasons retained as much of the old building as possible while constructing a new church. The pit became the crypt of the church and much of the walls survived with old openings being blocked up and new openings being inserted. The Smock Alley Theatre was renowned for the quality of the acoustics and fortunately this important characteristic was retained in the new church building. Left - St Michael & John's Church, Smock Alley, Dublin, in a photograph taken in March 2009 - Courtesy Des Kerins. In a way you could say that the old Theatre lives on today, as there is a remarkable similarity between the Theatre and the facade of the church which closed about 1990. 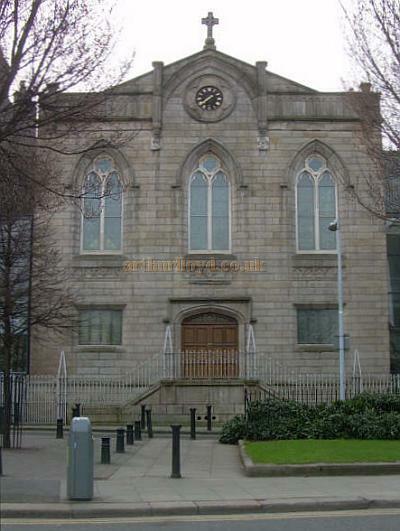 In 2009 there was a small Studio Theatre housed in part of the building with 110 seats, and planning permission had been granted for the construction of a new Theatre within the building at a cost of about €7.2 million. In August 2009 archaeologists doing preliminary excavations on the site, before work began on building the new Theatre complex itself, discovered artifacts and part of the original Smock Alley Theatre had survived. - Above Text and Image (Left) Courtesy Des Kerins 2009. Renovation of the building took six years but the new Smock Alley Theatre opened within the building in May 2012. The Theatre is now home to various styles of entertainment such as plays, music, circus, choral events, and the like, and the Theatre is also home to the Gaiety School of Acting, the National Theatre School of Ireland. The Smock Alley Theatre has three main spaces, the Smock Alley Theatre itself with 178 seats, the Black Box with a capacity of 80, and The Banquet Hall with a 200 capacity. You may like to visit the Smock Alley Theatre's own website here. This Theatre should not be confused with the three Theatre Royals in Hawkins Stret, Dublin.